The fabled 'Luck of the Irish' has long been a source of inspiration for slots developers, whether it's Rival Gaming's Celtic-loaded Shamrock Isle, with its Expanding Wilds, Playtech's own take on the Emerald Isle, Irish Luck, or any number of cliched 'Irish' games. And while the Irish haven't exactly had their fair share of luck of late (we can't quite see anyone releasing a slot called Multi-Million Euro Bailout anytime soon) it hasn't stopped other slots designers stocking up on Celtic clip art and letting rip. 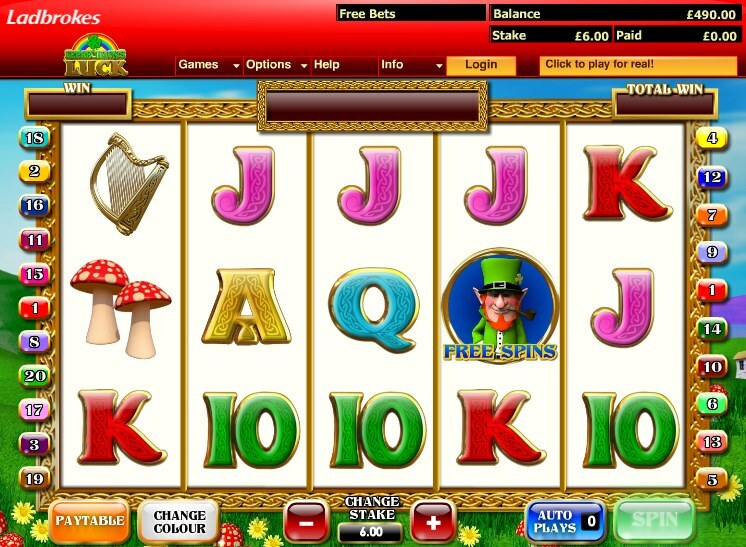 Online slot developer Ash Gaming have joined the herd in unleashing an Irish slot on the gaming public, and at first glance it has all the right hallmarks: leprechauns - check; harps - check; Celtic-style poker symbols - check; someone with a terrible Irish accent doing the voice over - check. Hell, there are even pints of Guinness in this slot! Joking aside, at least you get what it says on the tin with this 5-reel, fixed 20 pay-line slot. There are leprechauns galore, pots of gold, bonus round aplenty, and if you're betting the max, two progressive jackpots to be bagged. Once you've got used to the idea of playing fixed lines (meaning you'll have to bet at least $0.20, with a max bet of $100 possible) it's time to concentrate on the game's bonus features. Look out for the game logo Wild - it substitutes for all symbols other than the Scatters and bonus symbols. Five Wilds across the reels pays out a 10,000-coin jackpot, so it's really worth bagging. There are several Scatters to look out for. Three or more Pots of Gold triggers the 'Rainbow of Wealth' bonus game. Spin the wheel and move forward along the path until you reach the pot of gold. Keep moving along until you land on a Collect symbol, where your go ends. Light all the colours on the rainbow, however, and a fat, juicy progressive jackpot can be yours. 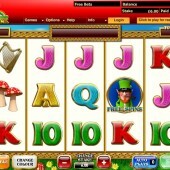 The Leprechaun symbol, meanwhile, activates a generous free spins round when three or more appear on the reels anywhere. Our Irish friend bounds onto the screen and awards you a random number of spins by puffing smoke into the air. Then, once the spins start, he'll jump across the screen, turning various squares Wild for the duration of the freebies. Finally, the Wishing Well icon (which we found a little hard to come by) triggers the last bonus game when appearing on the middle reel. Here's your second chance at a progressive jackpot. The bucket drops down the well, collecting prizes on its way to the bottom. If you find gold at the bottom of the well, the jackpot booty is yours! While Leprechaun's Luck won't win any prizes for originality, its bonuses should ensure a fun time for everyone, regardless of their wallets. Check it out at your nearest Ash Gaming casino, or click on the link on this page.